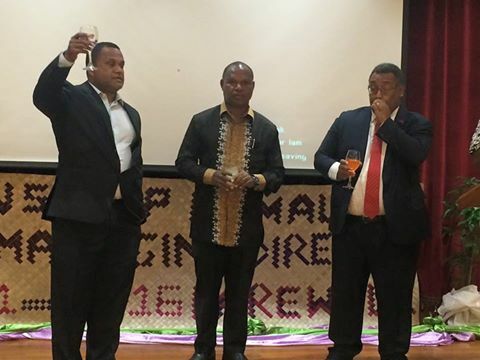 The Investment Promotion Authority (IPA), yesterday farewelled its CEO who will take up his new role as the PNG APEC Ambassador. The outgoing, Mr Ivan Pomaleu who played an outstanding part in contributing 15 years of his time to IPA was farewell by staffs, colleges including special guests and the Minister for Trade Commerce and Industry Hon. Richard Maru. Minister Maru who made time available despite his personal commitment in Brisbane, described Mr Pomaleu as the most outstanding CEO under his leadership for the past four years. He thanked Ivan and said he will continue to support him in his time in the Cabinet. His successor Clarence Hoot said Ivan left a big gap to fill, but he is positive about taking up the new role as CEO. Mr Pomaleu also thanked the IPA and the Board for he wouldn't be where he is now without the solid team of IPA backing him. The farewell dinner also featured some video entertainment as well as live band performance.